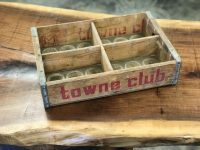 Has the perfect storage by way of vintage crates. This would make a nice bed bench or extra seating in any living space. Crates Used: 18″ x 15″, Tall 6″.